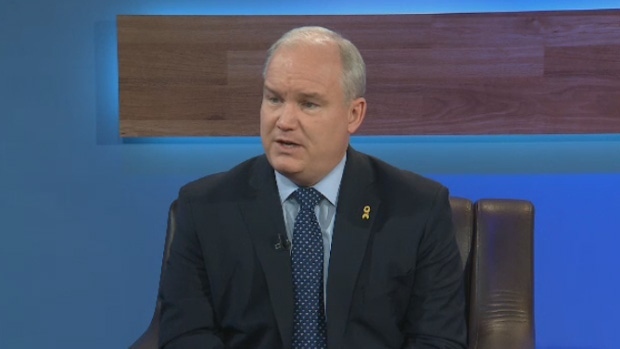 Conservative MP Erin O'Toole says his party is willing to work with the Liberals on NAFTA. OTTAWA -- Attack mode, says the Conservative Party's new foreign affairs critic, will not be the opposition's first instinct when dealing with the Liberal government's renegotiation of the North American Free Trade Agreement. Conservative MP Erin O'Toole says his party is willing to offer non-partisan support to the Liberal government during the continuing NAFTA renegotiation, which entered its second round this weekend in Mexico City. But only as long as the Liberals keep the focus on job creation, securing market access and levelling a playing field that he says has given Mexican labour an unfair advantage. O'Toole said the Tories have no time for the "virtue signalling" on gender, Indigenous and environmental issues that the government has also raised as bargaining priorities. If the government takes those priorities too far, O'Toole said he will lead the Conservatives back into political battle. "For me, I don't always lead with the attack if I don't need to. I'm very capable and very effective at the attack if it comes to that," O'Toole said in an interview. It's a position that's been crafted in discussions O'Toole said he has had with his new leader, Andrew Scheer. And it comes one month after the Liberals and Conservatives traded some partisan barbs over NAFTA. It was a summer skirmish that dulled the glow from the rare detente the two parties arrived at earlier in the year, when interim Conservative leader Rona Ambrose threw her party's support behind Prime Minister Justin Trudeau as he embarked on finding common ground with NAFTA-bashing U.S. President Donald Trump. Former Progressive Conservative prime minister Brian Mulroney -- who presided over Canada's initial free trade pact with the U.S. -- also briefed the Trudeau cabinet on Trump, his long-time Florida neighbour. Then the old battle lines were redrawn after the government's $10.5 million payout to Omar Khadr, the Canadian citizen who was imprisoned and tortured at the notorious U.S. detention facility in Guantanamo Bay, Cuba. Several Conservative MPs denounced the payment in various U.S. media, including Peter Kent in the Wall Street Journal in a column entitled "A Terrorist's Big Payday, Courtesy of Trudeau." Trudeau accused Scheer of undermining Canadian interests in the U.S. on the eve of NAFTA talks. Scheer dismissed that as desperate attempt at political channel-changing. For now, said O'Toole, the dust has settled. "There is a lot of goodwill for us to work on it," said O'Toole. That's because trade is the Conservative legacy -- the original free trade deal with the U.S., NAFTA, the Canada-EU pact, were all instigated by Conservative governments. NAFTA and the Canada-EU pacts were finalized by Liberal governments. "We want it to be a positive. We know how critical it can be to jobs in our economy." The Liberals did not react kindly to O'Toole's comments, taking to Twitter on Sunday to denounce them. "Ensuring NAFTA isn't a race to the bottom on the environment isn't 'virtue signalling,"' wrote Environment Minister Catherine McKenna. Trudeau's Principal Secretary Gerald Butts wrote that Scheer recently said the environment and economy "go hand in hand. That lasted a week. It's still Stephen Harper's party." Jerry Dias, the president of Unifor, also blasted O'Toole for deriding some of the government's bargaining priorities. "What a tool... Are you kidding me? One of the biggest (investment) advantages Mexico has is they don't have environmental standards. Anybody can come in and dump here, " Dias told The Canadian Press in an interview. Dias, who is in Mexico observing the negotiations, said it's similar on gender parity, saying that women in the United States can be forced to return to work shortly after giving birth. In the interview, O'Toole also said he has great respect for his prime political opponent, Foreign Affairs Minister Chrystia Freeland, who is also in charge of NAFTA and Canada-U.S. relations. He said they struck up a rapport when he was the Conservative parliamentary secretary on trade and she the Liberal trade critic. "We have a friendship; I admire her a great deal." But that warmth does not extend to other members of Trudeau cabinet, or the prime minister himself. "What I want to see out of Canada is less of the virtue-signalling type of approach where we put the centrepieces of Justin Trudeau's image building -- the gender equal cabinet, the reconciliation -- they're all important but this is an economic trade agreement," said O'Toole. "I don't think anyone who's had a casual observation of the Trump administration will suggest that their priority is going to be environment, Indigenous and other things like that." But when it comes to making progress on labour rights, the Liberals and Conservatives are on the same page. Low wages and poor working conditions have given Mexico an unfair advantage, particularly in the auto sector, he said. O'Toole said NAFTA should strive to find ways to elevate Mexican workers with higher pay, better working conditions, benefits such as workers' compensation -- "a whole range of additions." "At times we will have mutual interests with Mexico, but at times we will not," he said. "That's also got to be the realpolitick with this."